Welcome! Here is my contribution to Math Twitter Blog-o-Sphere Mission #1: What is one of your favorite open-ended/rich problems? How do you use it in your classroom? I was looking for a way to open a discussion of functions with one of my tutoring students last summer and found a lesson on the Internet called The Shapes of Algebra, which (at least in one version) included a great Ice Breaker activity. (See references below.) 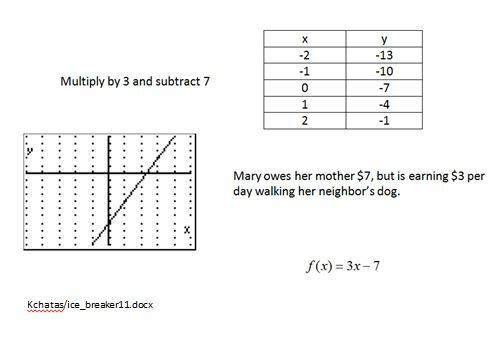 This activity asks students to consider five functions – represented in five different ways (verbal, tabular, graphical, function notation, and as an application problem) – and determine which representations belong together. One example is shown below. After printing the file, cutting apart the different representations and mixing them up, I gave my student the pile of cards with only the briefest of explanations: Which ones go together? It was wonderful to watch how engaged he was as he first figured out what he was looking at, and then went to work puzzling out which cards described common situations. His initial groupings contained several errors, but he corrected most of them on his own as he worked through the set of cards. To finish the activity, he taped each set of representations to a piece of paper labeled with the name of the function, creating a personal reference for the rest of our lessons. In addition to creating a introductory experience with different types of functions, this activity generated lots of great conversations about interpreting graphs, identifying slopes and rates of change, as well as the meaning of function notation. Each of the five functions are completely different (linear, quadratic, reciprocal, absolute value, and exponential) and nicely set the stage for the rest of my planned function lessons. In a classroom, I would definitely use this lesson as a group activity. I would create “kits” of the cards so that (ideally) each group would have a complete set for a different function along with lots of cards for other functions so they had opportunities to compare and contrast different representations. I think this activity would spark a great discussion and I would follow it with The Shapes of Algebra explorations using the Function Explorations document I created. The document both structures the activity and provides a nice way to collect students’ observations about the way the functions change. Desmos is a great tool for students to use for graphing the functions, but a graphing calculator (or even pencil-and-paper!) will also work. There are several links for The Shapes of Algebra handout (including one for an online version), but I can’t seem to find the link where I found the ice breaker activity. You can use my link, or Google (including the quotation marks) “Mary owes her mother $7” and you should find the file. This entry was posted in MTBoS on October 11, 2013 by galenaylor. I love this activity! I’m totally going to use it down the road after exploring more types of functions. I’m curious, if students get “stuck”, how are you helping them along without revealing too much? Thanks for the share and joining MTBoS! Thanks, Brandon! I actually had a paragraph about what I did when my student got stuck, but I deleted it because I thought the post was getting too long! In this case what I did was put two of the verbal description cards next to one of the application cards (or vice-versa, I forget) and ask him “which one doesn’t belong?” He looked at them for a minute and then it clicked. Now, if he hadn’t gotten it right away, I probably would have pulled out more of the cards to compare and ask him what he noticed about the cards and hope he would notice that some are stories and some are just talking about numbers and operations. I definitely overstep and help students too much sometimes, but I try really hard to ask questions instead! I am leaving a more open ended comment because I was reading your past blog posts. I am an elementary teacher so reading secondary math blog posts have less immediate application. I love math and I want to impart that love to my students. I appreciate your holistic approach to math. I am interested in creating assessments that help pinpoint where the understanding is breaking down. What tips or advice would you have for me? First of all, I love that you want to pass on your love of math to your elementary students! Thank you! Thank you! Figuring out where a student is having trouble … that’s really the key, isn’t it? Not only *what* students are misunderstanding, but *why*? Although that’s the reason I started my blog, I am far from an expert. But for what it’s worth, here are my thoughts. it seems to me, if we’re going to pinpoint where a student’s thinking is going awry, we need assessments that let students “show” their thinking. That sounds really obvious, but I’ve spent about 10 minutes rolling the idea around in my head trying to come up with specific ways to do it. Of course, avoiding multiple choice problems is probably a given. Another idea might be to break a more complicated problem into separate steps so you can see at which point students are running into trouble. Or possibly design a problem that only addresses a very narrow part of a topic. I don’t know if it is feasible for you to do this, but I always have better luck when I watch a student solve a problem or ask them to explanation their thinking. I am very alert to hesitations that indicate students are unsure or confused, and by watching them work, I also see what kind of mistakes they make and then correct while they work. (Sometimes they write the correct answer and then erase it, too. It still indicates an area that needs work.) Also, I think any problem that can be made physical, e.g., with manipulatives, would help provide insight into a student’s thought processes and might illuminate a lack of understanding or misunderstanding that could then be corrected. Hope that gives you some ideas! This looks like a great activity. It seems like it would be appropriate for my Algebra 1 students, although there are a lot of functions in there that they aren’t familiar with. Thanks for sharing! Thanks,Heidi! I think this activity would be great for Algebra 1 students. Particularly if you have access to a computer lab and the students could use Desmos to graph the functions, I think they would get a lot out of seeing what the functions look like and comparing them, even if they are not (yet!) familiar with some of them. I love that the activity includes a linear function that most students are familiar with! This does look like a great activity- It would really be great as an introduction activity to just see what vocabulary students do have. You could also extend it by showing students how to use Desmos with sliders in the functions to make it a bit more open ended. Thanks for sharing! I agree! Using the Desmos sliders is a great way for students to get an instant feel for how functions can change. And you’re right about the vocabulary aspect. Over the course of the summer, through this activity and the follow-on exploration I did, my student’s observations about the features of the various functions became much more precise. It was very gratifying! whole lot and I view it that is professional, easy to comprehend. I congratulate you for this article that I am going to tell to prospects around. I ask you to recommend the gpa-calculator.co site where each pupil or scholar can calculate results gpa marks.